When people meet Capt. Kelsey Casey, they don’t initially think the petite, young woman with an energetic personality is a pilot in the U.S. Marine Corps, but once she starts talking, her charisma becomes apparent, and it’s understandable why she’s the only female AV-8B Harrier pilot in the Marine Corps. Her dream of flying started at space camp at a young age. To her delight, she was picked to be the simulated pilot and climbed into a small, fake cockpit built to simulate a spaceship taking off. Casey attended the U.S. Naval Academy following high school. She planned to major in aerospace engineering and Chinese, but learned she would have to attend a year longer than planned, putting her at the bottom of the list to be a pilot. This eliminated her goal of becoming a pilot via the academy route. To fulfill her dream, Casey had only one option – leave the academy. Casey found herself trekking across the country with everything she owned, trying to navigate her way through a snowstorm. She was alone, scared and her dreams seemed unattainable. It was her insatiable tenacity and refined grit which led her through the years that followed. The way Casey saw it, she had only two options: give up or complete her degree and fly. She chose the latter, and like all Marines, attacked the obstacles in front of her to accomplish her mission. After leaving the academy, Casey made her way to the Bay Area to attend San Francisco State University. During her senior year at SFSU, Casey found herself longing to return to the Naval Academy to fulfill her dream. Again she applied to the academy but was denied. At this point in her life, she was accustomed to adversity and was experienced at overcoming it. Refusing to give up, she sought out information and spoke to mentors, who encouraged her to pursue a career as a military officer. As a result of her unwillingness to quit, she found a way to accomplish her dream. After she earned a Bachelor of the Arts degree in political science at SFSU, Casey left for Marine Corps Officer Candidate School. Though her experience with the Marine Corps has been mostly positive, there have been interesting moments for Casey. While sitting at breakfast with her Marines, a nice older gentlemen with a veteran hat approached them, Casey explained. They all were in flight suits and wearing the same patches when the gentleman asked their table if they were all pilots. He seemed surprised to see Casey and specifically asked her if they let her fly. She laughed and informed him that not only was she a pilot, but she was also the one in charge. 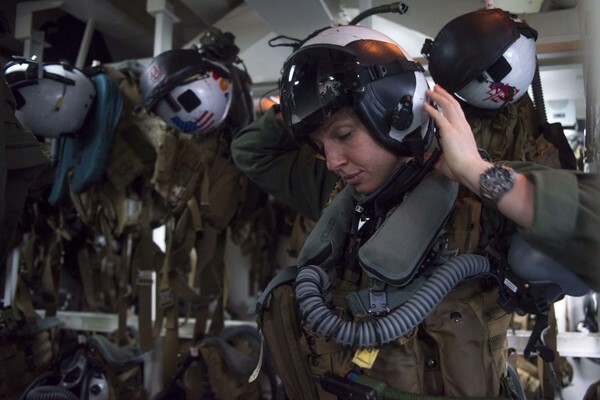 Interactions like these are somewhat common and highlight a misconception of gender roles in the military; situations such as this motivate Casey to keep proving them wrong. Casey believes that the most important lesson is to keep moving forward—an ethos she learned from her uncle, who told her “they can’t kill you, and they can’t stop time.” This advice has helped her overcome many obstacles. Casey has come a long way since being that wide-eyed little girl with aspirations of flying. Despite a difficult start, Casey succeeded and continued to excel. She completed her training and earned her wings of gold.